Neil Vaughan, the founder of West Country Fencing Supplies Ltd., has been involved with the fencing and landscaping industry for over 25 years, erecting fencing and hard landscaping throughout the 1980s and 1990s. He later moved into fencing manufacture for a multi million pound national operation within the fence panel and landscaping sector. 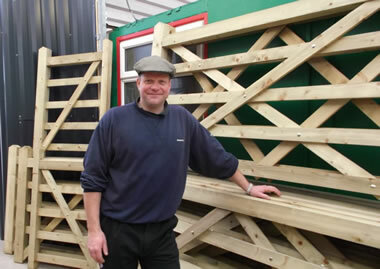 At the turn of the 21st century, he took the opportunity to move into the buying and selling of all types of fencing, decking and landscaping products for a large regional fencing and landscaping supplier, providing product to the domestic, agricultural, industrial and security aspects of the industry. West Country Fencing Supplies aims to provide quality, value and service to the trade, contractor and public. We at WCFS understand that the customer is our most important and valued part of the business. We are able to offer free local delivery (this may be subject to a minimum order value and logistics), and we offer free professional advice. We will always seek to work with the customer and his or her contractor to achieve the best possible results.